Valentine's Day is just around the corner and many of us will be enjoying a romantic dinner for 2 at home this year. 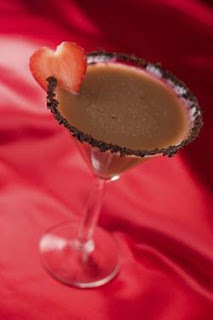 If you are one of those people (couples) who will be celebrating the big day/evening at home, how about whipping up a few Chocolate Strawberry Kiss cocktails to go along with that dinner? This recipe was sent to us by the great folks over at Three Olives Vodka and I think it looks delicious! I can't wait to try this one! Enjoy! Take a small plate or a saucer and coat it with chocolate syrup and chunks of chocolate . Dip the rim of a chilled martini glass in the mixture and spin back and forth until the whole rim is coated. Combine vodka, chocolate liqueur, strawberry liqueur, half & half in a shaker filled with ice. Shake vigorously. Strain into the martini glass. Garnish with a strawberry slice.